When Diamanda Galas released her debut album, ‘Litanies of Satan’, which, in my humble opinion, stands as one of the darkest albums recorded yet, her painful, horrific cries for the dark lord are suddenly answered by the devil who agrees and come to have mercy on her misery. As she chants the old poem by Baudelaire, the answer comes in the form of an extremely low and unearthly voice. Like her invocation, Troy Schafer’s conjuring of Anubis is answered as well by a deep, low pitched and unsettling speech. ‘Anubis come in’ invites the ancient god in, and halfway through this recording, it seems like Schafer is being answered by his guest, much like Galas was. Now don’t get me wrong, unlike the hostile, dark album by Galas, Schafer presents a wholly different approach, which suggests other directions. ‘Anubis come in’ opens with eerie melodies of slightly detuned strings and nerve breaking squeaks that are forming together a memorable gateway to the thirty minutes long ceremony that Schafer is conducting. Vague chanting and energetic violins add a more spiritual dimension to the entire recording, which also includes many different layers of sounds that add up together to a very detailed picture with numerous high contrasts. One of these contrasts is the collision between what sounds like computer based sounds and what sounds like acoustic instruments. On different points of the album, Schafer races the listeners’ heart beats with intensifying electronic shrieks, while the acoustic music, unsettling enough without any electronic assistance, is marching on. 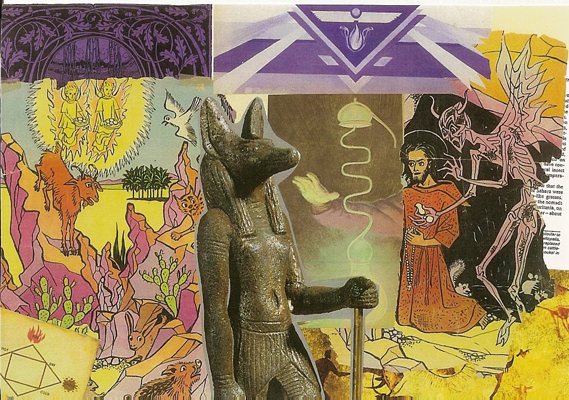 It seems like this invocation for the entrance of Anubis is using this method in order to provoke the body into a meditative catharsis, as if for channeling the ancient god. At the peak of this process, halfway through “Death Spirit of all”, a sudden burst of insane human shrieks suggests about a successful bonding of Schafer with the spirit, and also about the approaching end of the album, almost as if Schafer is declaring – The ceremony is over!.